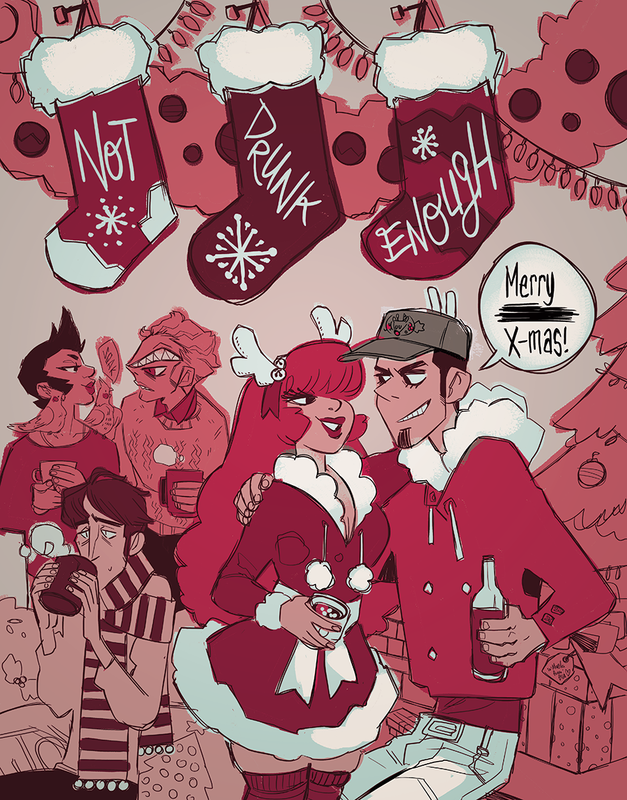 Not Drunk Enough - MERRY X-MAS 2018!!!! Back to updating and a store moving sale!! I know it's been a minute! My surgery went extraordinarily well, and recovery went smoothly and I feel incredibly lucky and happy!! My last day in retail is going to be THIS Friday, and I'm utterly stoked at the new amount of time and attention I can pour into my projects, including NDE! I have a lot of really wonderful things in the works--you may have even seen the really cool announcement that I will be working once again with Ananth Hirsh on a book called Greater Secrets with Random House Graphic! I'm so honored and it will be a DELIGHT and can't wait to share even more with you guys, soon. On top of that, my store is going to be moving so will be closed temporarily! Bigger and better things are on the horizon, (I can't wait!!) but until then, you can catch a VERY awesome 15% off sale! A wonderful way to grab a few things you were maybe eyin' for a while! Simply enter in the code 15MOVING at checkout!! Click here to go to my shop!! I'll also be at Emerald City Comic Con again this year, with some amazing friends, so if you're going, please hit me up! I love meeting new faces and also seeing old buddies! I'll give out more information once I'm closer to the event itself, but it is absolutely one of my most favorite cons out of the year, so I'm just ecstatic. See you in Seattle! Last, but not least, I wanted to talk about Not Drunk Enough itself! I truly appreciate everyone's patience with how spotty it's been the past year. I love the comic so dang much, but so many things have come up and made it hard to update regularly. I have been working hard on it, though! The entirity of book two is inked and lettered, and now I'm just in a blind run to finish all the colors, so updating should be MUCH more steady! And you know what else that means! It means that working to get book two printed and out is going to be UNDER WAY!! LOVE YOU ALL, and I hope you are having a fantastic beginning of your week! As a tiny aside, I also made a Twitch channel in which I primarily play Dragon Age : Inquisition, but it's pretty darn fun! !